Hello I’m Sherry Green. This is my second trip back to the clinic. The first time I had 11 teeth done, the second time now, I had 4. The work was fantastic, saved a lot of money! The crew are very friendly. Very little pain. I saved a lot of money and I got to do some more vacation things with that, and I really recommend coming. Ok, what is your plan about the next trip? Next trip? sure. Take another week off work. Still be getting a little work done. A little is fine. It’s a great excuse to come to Cancun, to get work done! Ok, what do you think about Cancun? Oh, Cancun is fantastic. This is my fifth trip here. Yeah, absolutely wonderful. If you want to know more about what our dentists in Cancun Cosmetic Dentistry can do for you call toll free from USA and Canada 1-800-565-1424, or if you are already here and want to meet us, you can call us for an appointment at the following local number (998) 1-40-51-25. The secret behind hollywood smiles! 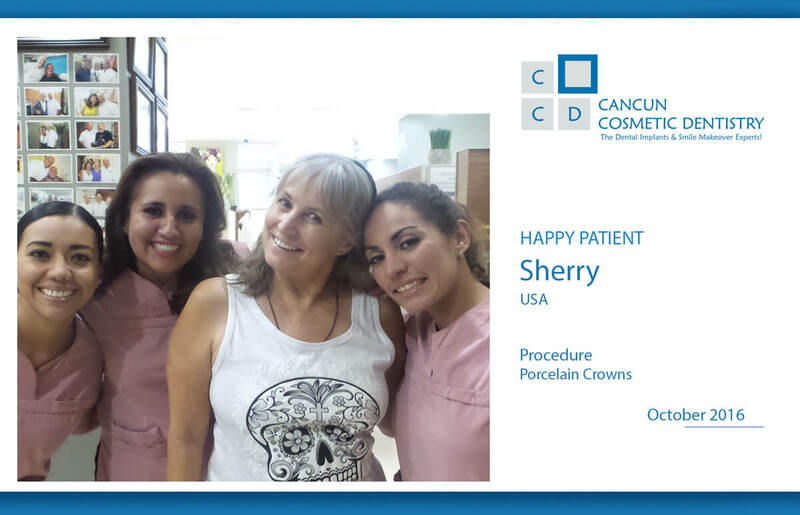 Amazing results with All on 4 dental implants in Cancun! Happy with affordable smile makeover with crowns and dental implants!